This BRIEFing NOTE is about one of two current initiatives that will significantly affect child care, providing pertinent information about proposed changes to Ontario's child care regulations. 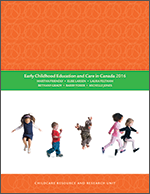 It first provides the context, then briefly summarizes points from the research literature on staff: child ratios, group sizes and other program features (such as staff qualifications) that are linked to these. Table 1 shows recommended ratio/group size regimes from US research; Table 2 compares current regulations to proposed regulations; Table 3 shows Ontario's current and proposed staff/child ratios and group sizes for a two year old in comparison to all provinces/territories.